Constipation and bloating are some of the most common gastrointestinal problems in the United States, affecting around 42 million people, or around 15% of the population. Bloating is a common symptom of constipation, and refers to trapped gas in the stomach and intestines. There are many causes of constipation and bloating, like certain foods, aging, or keeping an inactive lifestyle. It is important to avoid certain foods in order to prevent constipation and bloating. It is equally important to make certain lifestyle changes and try natural treatments to alleviate constipation and bloating. Constipation is described as a condition in which a person has fewer than three bowel movements a week. Constipation can be acute - meaning it is sudden and brief - or it can be chronic, lasting a long time. Constipation can be caused by many things, including diets low in fiber, lack of physical activity, certain medications, aging, and pregnancy. Typically, when people with constipation finally do have a bowel movement, the stools are hard, dry, small, or difficult to pass, causing pain. Constipation also causes bloating and pain in the abdomen. In many cases, constipation can be eliminated with simple lifestyle adjustments. Staying hydrated is key to feeling your best and keeping bodily functions running smoothly. Drinking water helps stimulate the digestive system, preventing constipation. It is important to maintain a healthy diet in order to maintain digestive health and regularity. Eating plenty of fiber is essential to preventing constipation and bloating. Apples, bran cereal, rye bread, and almonds are all fiber-rich foods that can help relieve constipation and bloating. Exercising can help alleviate constipation and bloating by stimulating digestion and releasing trapped gas. In addition, exercising provides numerous health benefits, such as improved mood, reduced stress, improved sleep quality, and efficiency of the heart and lungs. Yoga, walking, and cycling are all excellent forms of exercise that are easy to incorporate into a daily routine. Coconut oil has recently gained recognition for its versatility and various health benefits. Coconut oil is anti-inflammatory, helping to relieve bloating and pain. Coconut oil is also thought to regulate digestion and promote intestinal health. Getting plenty of sleep every night is essential for your body to function properly. 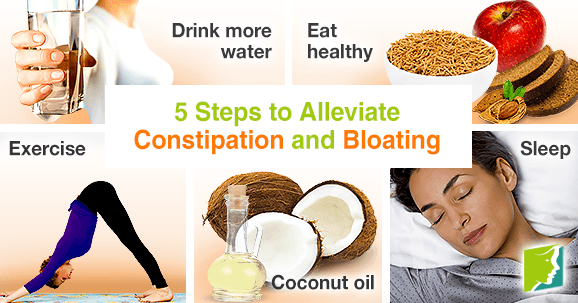 This includes preventing constipation and bloating, as well as other complaints. The average adult needs between seven and eight hours of sleep every night. Constipation and bloating are frustrating and often painful symptoms that affect around 42 million Americans on average. It is important to maintain an active lifestyle and eat properly in order to prevent constipation and bloating. Avoiding fizzy drinks and limiting consumption of beans, cabbage, and sprouts can also help prevent constipation and bloating. Learn more about these symptoms and how to treat them.